1. Where did you go to school, and where did you grow up? Also, tell us about your family. I grew up in Mishawaka and attended Mishawaka Marian High School. I went to Ball State and earned a Bachelor’s degree in Special Education, then earned my Master’s in Special Education from Indiana University South Bend. I moved to Knox after graduating from Ball State to teach at Knox Middle School for 4 years, then I transferred to the high school for the rest of my 39-year career in special education. I also taught future teachers at IUSB part time for about 8 years. My husband, Chuck, and I have been married for 37 years and we have 2 children and 5 grandchildren. I love doing any kind of crafts, including paper crafting, card making, scrapbooking and crocheting. I also enjoy being with my grandchildren, watching them grow and develop, and just being a Grandma! I’m a retired special needs teacher for the last 6 years in which time I have gotten very involved with the St. Vincent de Paul Conference at St. Thomas Aquinas in Knox. I recently organized our 3rd annual Friends of the Poor Walk/Run which helps to fund our mission to help those in need in Starke County. I am also vice-president of P.E.O. (Philanthropic Education Organization) in Starke County. 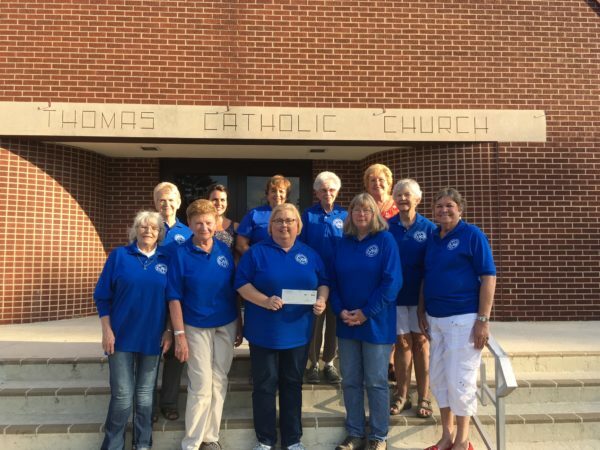 Mostly I’m involved with St. Thomas Aquinas Church, as a member of the Parish Council, a lector, and a participant on many other groups and committees. When I first moved to Knox, I thought this would be a good place to get a couple years of teaching experience and then move on, but here I am 40 some years later! This is a great community in which to raise kids. Our children benefitted from attending a small school where they had opportunities that may not have been available to them in larger schools. Bigger isn’t always better! The saying “good things come in small packages” applies to small communities as well. I also love the closeness of the people here. The people you work with are the same people you worship with. They are the parents of your children’s’ friends, and people that you meet in social situations. I became involved in the Community Foundation when I applied for a grant for the St. Vincent de Paul Society in Knox. I also starting attending the quarterly Service Providers lunches representing St. Vincent de Paul. That led to getting to know Sarah Origer, talking to my good friend Suzy Bishop, also a board member, and one thing led to another and I was asked to join the board. I don’t think most people realize the impact of the Community Foundation and how much good it does in Starke County. I know I didn’t, until I got more involved. I like being a part of an organization that serves our community and impacts a diverse array of areas that effect most all of the people here in one way or another. That’s what is most important—the money is helping right here in our community. I’m excited to be a new member of the board and am looking forward to helping the Foundation in any way that I can.